Whether you’re a fan of red wine or not, there’s a good chance you’ll like its not too distant cousin, rosé. The pink-hued vino is slightly lighter on the palate than a red, and although it comes from the same grape, tastes fruitier and crisper. Here, we’ve rounded up the best rosé wines on the market you need to try. The main thing to consider when picking a bottle of rosé is what tasting notes you like and when you plan to drink the wine. If looking for a wine to have with dinner, then a dry but fruity rosé such as the Domaines Ott Clos Mireille Rosé complements fish and other light dishes very well, as do many wines from the Côtes de Provence region. If you like a sweet rose such as a Zinfandel or Grenache, then you may enjoy a Pinot Noir such as the Camel Valley Pinot Noir Rosé Brut which is also a great twist on classic bubbles such as Champagne or prosecco. Take a look at our full list below to see which rosé is best suited to your palate. The Camel Valley Pinot Noir Rose Brut is a fruity flavoured wine with hints of strawberry and raspberry. This is a sparkling wine that would make a great bottle for celebrations or simply enjoying a light drink with dinner in the summer. This is a local wine from the south of England and is dry and crisp on the palate. Those who have tried this wine found it to be very easily drinkable and excellent value for money compared to Champagne. So if you’re looking for something a little different when it comes to rosé, check this one out. This full-bodied rosé is light but still a little more intense on the palate than some. Made from the Grenache grape, you’ll taste notes of citrus and passionfruit with a crisp finish that lingers on the palate. If you don’t like super sweet rosé, then you may find this one to be a little more balanced and complementary to many foods such as fish and pasta, but it tastes equally great on its own as an aperitif. This light-coloured rosé is very delicate and crisp. Recommended for pairing with fish such as smoked salmon, you’ll experience a blend of Cinsault, Grenache and Syrah, which form a subtle strawberry taste with a balanced acidity and beautiful after taste. If you’re a fan of both fruity and full-bodied rosé, this one gives you the best of both worlds. If you’re a big fan of the cheese board but not a fan of the red wine that’s usually paired with it, then you could try this rosé wine. It’s a dry rosé with a warm spicy taste to it that complements charcuterie and cheeses very nicely. You can expect hints of white pepper that are then lifted by light peachy notes that balance this wine out nicely. If you really don’t like sweet rosé wine, then you’ll find the warmth of this wine has a refreshing acidity that goes down a treat. 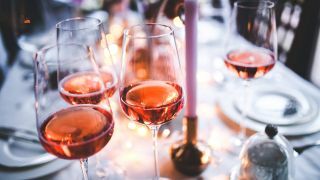 This blush rosé from the Côtes de Provence region is very delicate-tasting, making it the perfect wine to pair with salads during the summer but would complement almost any dish. Those who have tried it can’t get enough of the slightly fruity, dry wine that is light on the palate, making it dangerously moreish. Try this wine if you’re not a big fan of rosé and we’re sure it will change your mind. This rosé from the South of France offers a slightly more lively taste than that of the others on the list. With an acidic citrus blend and subtle floral notes, you can expect a deliciously warm and lively taste from this wine. It is recommended as a pairing with shellfish, and the Tibouren grape turns this wine a beautiful pinky-orange colour. Some users found this wine a little too acidic, but if you’re not a fan of Grenache, then this is the wine to suit your palate.